An empowering opportunity to gain technical skills in a safe and supportive environment. We hope to encourage more women to seek leadership positions in the land management industry, or pursue their field of interest with a renewed sense of pride in their identity. 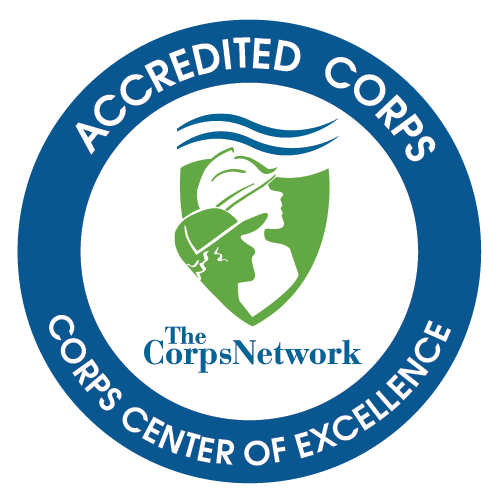 ICC’s Women’s Crew is an innovative AmeriCorps program designed to provide hands on training and experience to those interested in pursuing employment with conservation corps, land and water resource management agencies, and other outdoor careers. The Women’s Crew integrates team-based work projects, education, and on-site vocational training into an experience that prioritizes personal growth, and the development of conservation work skills. Participants will develop technical skills working on a variety of conservation projects while developing the soft skills needed to be successful in the outdoor industry. Participants spend five months camping, working and traveling together as an eight- person team. You can expect to work on physically challenging conservation projects in any kind of weather, gaining hands on experience in the groundwork of stewardship. Each day, you will return to camp after work and participate in community activities, including meal prep, water collection and treatment, and tool maintenance, followed by a family style dinner. Evenings will be spent on various educational and recreational activities; including formal lessons taught by team members, group discussions, and stargazing around the campfire. The Women’s crew will work on high priority conservation projects for land management partners like the Forest Service, BLM, and Bureau of Reclamation. Some crews may be focused on construction of bridges and kiosks, while others may be focused on the restoration of at-risk landscapes and watersheds. Other projects may include fuels reduction or GIS mapping and survey. Each crew will have a project specialty and will receive training and certification appropriate to that theme. Training: The primary focus of the program is to prepare members for fulltime employment with a combination of field work activity and industry-recognized trainings. Program participants will receive some or all of the following trainings and certifications depending on their crew’s primary work focus: Wilderness First Aid, Herbicide Application, Chainsaw Operation, Leadership, Trail Construction and Maintenance, Brush Cutter Operation, Resource Management, CPR, Conflict Resolution, and Map and Compass Orienteering. Work Project Participation: Participants will be part of an eight-person crew lead by one staff member. Participants are responsible for the safe completion of assigned work projects in a timely manner to predetermined specifications under the direction of their Crew Leader. They work closely with program staff and other participants, paying specific attention to safe work practices, proper tool use, and work quality and efficiency. Projects may include trail building and maintenance, fuels reduction (chainsaw), tree planting, invasive species removal and herbicide application, fence construction, and park maintenance. Development: AmeriCorps Participants participate in educational group discussions at least two times a week. Members will be required to participate in at least one volunteer activity over their term of service. An Individual Development Plan will be created by each member to foster self-improvement and reflection as the program progresses. Hours: During the five-month program, crews typically work 9 days on followed by 5 days off. A campsite and transportation to the campsite with the crew will be provided for the days on with subsequent transportation back to our Boise headquarters at the end of each “hitch.” Housing is not provided on days off. Members must complete a minimum of 900 hours of service, averaging 80 hours per two-week hitch - including work, training, education, and travel time. A 30 minute lunch and at least two breaks will be provided each day. No vacation time is provided during this program. - Education-Minimum of a high school degree or working towards a high school degree or GED. Course work in education, leadership, resource management, and recreation preferred. Apply online at www.nwyouthcorps.org/JoinNYC. Please indicate Women’s Crew in your Cover Letter before submission.